When I started blogging, I used Blogger.com. 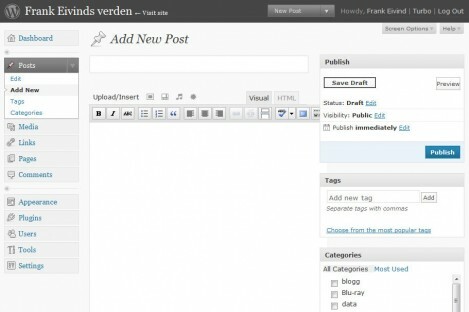 That is a great place to start for new bloggers. But after some years, it started to be a bit limiting. I wanted to store some files, have better controll over what I upload etc. So I started looking for some alternative. I found WordPress which had everything I needed and I also got my own domain (from One.com) which I do recommand if you blog a lot. It gives you more freedom and there are a lot of cheap options out there. Since I moved to my own domain in September 2008, WordPress have been updated many times already with bug fixes and new features. So this is great. The fine thing with WordPress is that it’s absolutely free to use, and if you don’t want to buy your own domain, you can sign up for an account at WordPress.com. Next you’ll begin to notice the new features subtly sprinkled through the new interface: the new dashboard that you can arrange with drag and drop to put the things most important to you on top, QuickPress, comment threading, paging, and the ability to reply to comments from your dashboard, the ability to install any plugin directly from WordPress.org with a single click, and sticky posts. They have also put up a video.